We now have a fait accompli that Nepal will be carved up into 11 provinces. In any other country this would be called gerrymandering, but here it was just politicians who found appeasement too tempting to resist. Even though the political leadership knows that ethnicity-based federalism would be a disaster, they were too weak-kneed to oppose it. The only benefit proponents have been able to cite is that it would 'bring government closer to the people'. But existing evidence shows this argument to be flawed. Nepal has had elected local councils for nearly half a century now, first called District and Village Panchayats and now known as VDCs and DDCs. After the mid-1990s, these councils had elected officials till 2002, and since then have been run by state-appointed secretaries. But local politicians still play a decisive role in the distribution of pork-barrel funds and state allocations. These local bodies, in whatever form, have all along been bastions of corruption in which all party officials carve up the pie and collectively partake of it, irrespective of whichever party is at the helm in Kathmandu. The problem is that the feudalistic order continues to reign supreme, and most political leaders belong to local elites who have always derived their power ascriptively without having to be accountable to the community members in its exercise. This is why most politicians are corrupt in Nepal, and they get away with it with impunity under the cover of mutual protection. With such a feudal order remaining intact, Nepal's imminent federalisation would only mean dividing up the country into new feudal fiefdoms, and we will effectively be jumping from the frying pan into the fire. Wait, it gets worse. Take the example of the West Seti project, which the Maoist government has just awarded to China's Three Gorges after 15 years of deadlock, but which may never be built if we continue with federalism. As directed by the Natural Resources Committee of parliament, West Seti will be developed as a multipurpose project, which would mean that the 290 m high dam would submerge 2,166 hectares of land (619 hectares of that prime farmland) and displace 16,221 people in Doti, Dandeldhura, Baitadi and Bajhang. It would release 90 cubic metres of regulated water per second, sufficient to irrigate 270,000 hectares for non-paddy cultivation and 90,000 hectares for paddy cultivation in the downstream districts of Kanchanpur, Kailali and Bardia. The project's multiple benefits in terms of power and irrigation could fundamentally transform the life and economy of the impoverished Karnali region. However, a federalised Nepal would resurrect the same argument that has stalled Nepal-India cooperation in power projects like West Seti. Only this time the disagreements over who should pay for downstream benefits of water regulation would be between states within the country. The three-week shutdown of far-western Nepal by opposing sides this month just presages what such inter-province conflict over natural resources would look like in the future. With the division of the country into several autonomous entities, the question would be why the upstream provinces should not settle for a lower dam just to generate power if the downstream districts are not ready to compensate them by paying for irrigation benefits? The same thing would happen on the Budi Gandaki project for which Kuwaiti funds have lately been secured. Our pro-federal politicians do not seem to realise that there is a sanctity to the unique geography of Nepal whose integrity must not be tampered with in the name of populism. Despite our continued poverty and bad governance, Nepal is known and respected around the world for two achievements at least: the rejuvenation of our denuded forests through community forestry user groups, and the projected meeting of MDG targets on child and maternal survival through our nationwide network of mothers' groups and female community health volunteers. Both happened because of local empowerment. The lesson is that we need devolution of authority to communities themselves, and well beyond the feudal local elites. Devolving power to local ethnic warlords will keep Nepal poor in the name of redressing the grievances of marginalised ethnic groups. Bihari K Shrestha is a veteran civil servant who served with the National Planning Commission, and the ministries of health and physical planning and local development. this is what happens when the rule they make applies to themselves .. the incentive model itself is messed up. why not have referendum in key topics? simple. 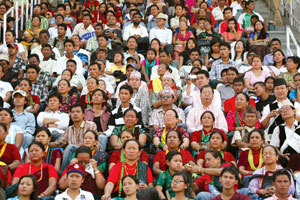 What you think if we make 500 rural + 100 urban local government in Nepal? Under this modality even Thami or Chepang will have their identity and aspirations fulfilled with a sure chance for a leadership role for them at local level where they have concentrated population. There is no use of province or district administration if we can decentralize power to the local government with sufficient resources which we can have if we make a lean central government with only seven nationally important ministries say, foreign, finance, defense/home land security, law and justice, aviation, roads and transport infrastructure, energy and natural resources. The local government must have everything else - sounds lie a fantasy is not it?